The Double Slipper 67 inch acrylic bathtub will surely be the center point of your bathroom. The double slipper design allows either end to be used. Modern and vintage designs are merged together with the pedestal base. Includes tub, faucet, drain and supply lines. 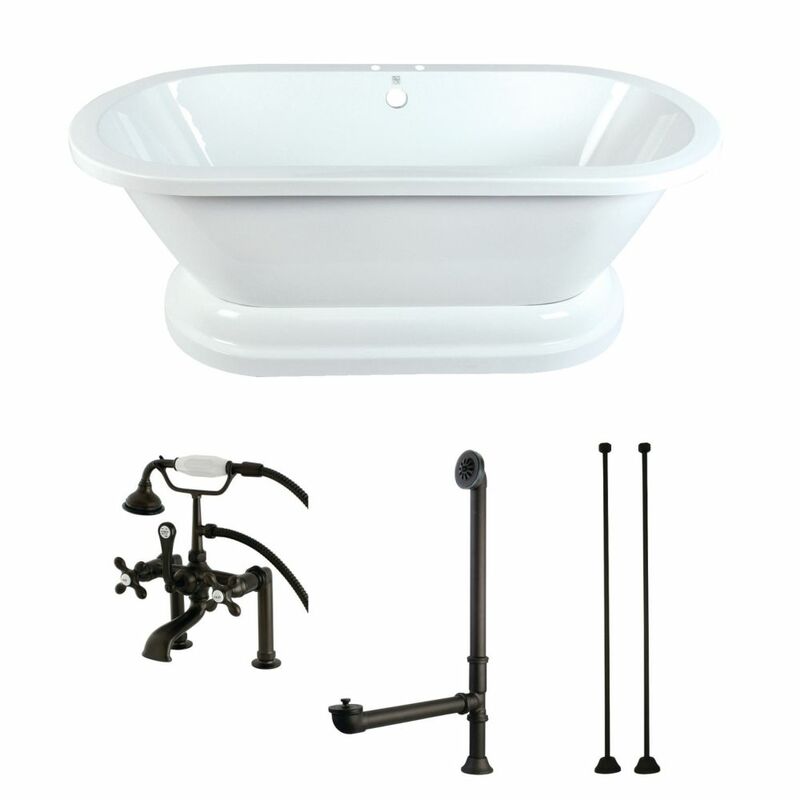 With a comfortable 67 inch L, this double slipper cast iron claw foot tub adds a vintage touch to your home bathroom. With timeless styling and ornate tub feet, this tub will provide warmth and durability because of its cast iron construction. Sloped backs of the bathtub allow you to lean back and enjoy a nice read. Without pre-drilled faucet holes it will require the use of freestanding tub filler or wall-mount tub filler for use. With straight lines, the Contemporary 59 inch Acrylic Bathtub tub transforms your bathroom into a personal spa. The soaking tub will help you to relax comfortably with double ended design. In a durable acrylic construction with fibreglass reinforcement. With elegant looks, the Fusion Freestanding acrylic tub and faucet combo transforms your bathroom into a personal spa. Relax comfortably with the classic slipper design in a durable acrylic tub constructed. The bathtub includes waste and overflow and holds up to 52 Gal. of water for a spa like experience. The modern freestanding faucet gives the finishing touches of this combo set. Transform your bath to a personal oasis with this large double ended acrylic tub. With gentle curves and smooth lines, this tub is a perfect fit for those with transitional or contemporary designs in their home. This tub pairs well with freestanding tub faucets or wall mounted tub faucets. Pedestal 5.6 ft. Acrylic Flatbottom Bathtub in White and Faucet Combo in Oil Rubbed Bronze The Double Slipper 67 inch acrylic bathtub will surely be the center point of your bathroom. The double slipper design allows either end to be used. Modern and vintage designs are merged together with the pedestal base. Includes tub, faucet, drain and supply lines. Pedestal 5.6 ft. Acrylic Flatbottom Bathtub in White and Faucet Combo in Oil Rubbed Bronze is rated 3.7 out of 5 by 6. Rated 2 out of 5 by Mike from The finish flakes off the drain after one week of... The finish flakes off the drain after one week of use. Having trouble getting a replacement from manufacturer. Rated 1 out of 5 by Monica from Was not as sturdy as expected, the bottom portion of the tub does not fully flush with the top pa... Was not as sturdy as expected, the bottom portion of the tub does not fully flush with the top part of the tub so there are small gaps around it. Also, the tub did not come with holes pre drilled for the faucet, my husband thankfully is handy and was able to drill them due to time constraint, we did not have the time to return and re order for our new house. Rated 4 out of 5 by Bnappi01 from Beautiful tub We love the classic and lightweight look of this pedestal tub, it’s exactly what we were looking for at a reasonable price point. The handheld attachment is a dream for washing my 3 little girls’ hair. The only issue is that the paint on the drain hardware (oil rubbed bronze color) completely chipped off within the first two months, with limited use. I guess you get what you pay for. It’s been 6 months and luckily the faucet attachment is still in good shape, without chipping. Rated 5 out of 5 by Kas from Perfect fit, look great! Perfect fit, look great! Rated 5 out of 5 by Kristin from Beautiful tub and we absolutely love it!... Beautiful tub and we absolutely love it!